Never underestimate what you can fit in a small space – even the smallest room can be made into a bathroom. People often think that limited space can only take a shower unit but this can sometimes be a problem with low ceilings. Skillful use of space, combined with smaller fittings can result in the addition of a room you may not have thought possible. Plans for new bathrooms must always be checked with the relevant authorities. Think about how you can use every available space and try not to think of it as you would a main bathroom. Don’t think that you always have to include a toilet; you could be trying to include too much in one space. Oval baths are worth investigating as they can increase the illusion of space. If you do not have any natural light, ensure you have planned enough sources of artificial light. Low-voltage ceiling lights are much smaller than conventional fittings and small spotlights are ideal for low ceilings. Opinions differ as to the suitability of carpets for bathrooms. Personally, I have never needed to replace a carpet used in a bathroom. If a bathroom is en suite from a carpeted bedroom, I suggest you continue the same carpet into the en suite to make the room appear larger. 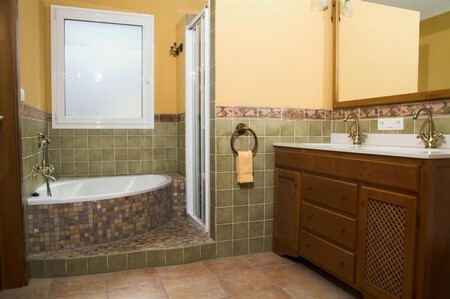 Small bathrooms will benefit from a link to the colours used in an adjacent area. With en suite bathrooms, look at the bedroom decoration and think how you can vary the use of the bedroom colours to give the bathroom individual, but related colour themes. Large patterns should not be restricted just to large rooms. Often the use of an ‘overscale’ pattern can ‘explode’ the space around it, thereby making the space seem larger. Check that your wallpaper is suitable for bathrooms or apply a coat of specialist varnish to protect the surface from steam and condensation. There will be little room for furnishings in a small bathroom. Cupboards will dominate a room, and make it seem even smaller. An alternative is to create a fabric skirt around a basin. This softer, decorative treatment is an inexpensive and effective means of including a soft furnishing element and you can use the space underneath for storage. Keep any tiles simple; a plain colour that blends with the walls will expand the width of the room and give the illusion of a higher ceiling. In a small area, nothing goes unnoticed. Because of this, hide any pipes behind false walls or else you will find your eye is drawn to them. Again, ‘less is more1 so do not clutter up any surfaces with unnecessary objects. Concentrate your efforts on beautiful essentials such as taps and light pulls. Buying bath essences in colours that co-ordinate with the overall colour scheme completes the picture.